Straight rock salt is found in the typical bright yellow bag and is the most economical of ice melters. It is a large pellet and melts snow and ice fast, however in temperatures below 22 degress F, it is practically useless. Recommended only for asphalt. Avoid contact with plants and grasses where possible. May cause irritation to dog paws. As with many ice melters, this product from Safe Step is a blend of ingredients (including potassium chloride, rock salt, and magnesium chloride). As a high quality blend, Safe Step 6300 provides many of the benefits of more expensive ice melters for less cost. The rock salt content is very low and in smaller crystal form, so the likelihood of causing damage to concrete, pavers, or brick is slim, when used as directed. Recommended for all surfaces older than 1-year, and asphalt of any age. Safer for pets and nearby plants and grasses. Melts down to -10 degrees F.
This product has a recognizable round pellet-shape. 100% salt free and safe to use around plants and pets. Safe to use in gutters or on roofs to breakdown or loosen ice jams that are preventing the free flow of water in your gutters. Recommended for all surfaces older than 1-year, and asphalt of any age. Very safe for pets and nearby plants and grasses. Melts down to -25 degress F (the lowest temperature of all ice melters). The fastest melting product of the bunch! If you are in search of the safest, most universal ice melter, look no further than this Magnesium Chloride solution from Safe Step. Safer than Calcium Chloride, its unique crystal shape works fast to melt snow and ice and will not leave a residue that tracks into your home. 100% salt free. Recommended for all surfaces older than 1-year and asphalt of any age. Safe for pets and nearby plants and grasses. Melts down to -15 degrees F.
Use only enough to melt the ice and broom off excess – Avoid spills or piles of chemical that will sit on the surface for a long period of time. Extended contact with ice melters, especially rock salt, can cause surfaces to be stained by the white residues left behind. For new areas of concrete (less than 1-year), flagstone, or pavers – Consider mixing Magnesium Chloride with sand and be careful not to over apply. The Magnesium Chloride will melt the snow and ice and the sand will provide some much needed traction. The big thing here is to never over apply and to broom off excess. Store in cool, dry place – When storing ice melters, you will want to roll the bags tight or pour into a resealable container. Our 5 gallon plastic containers located in our paint department are a great option if you don’t have something already at home. You want to avoid extremes in temperature and moisture, so that the pellets will not clump together. Shovel snow first when accumulation is at least 1 inch – Whenever there is accumulation, it is recommended that you first shovel to remove the snow from the area before applying ice melters. This provides a couple benefits: 1) You will use less ice melters, saving you money, and 2) you reduce the chance of the snow and ice refreezing in the same areas since it has no where to drain. Be careful with ice melters on wood decks – Wood decks can be more sensitive than concrete to the use of ice melters. 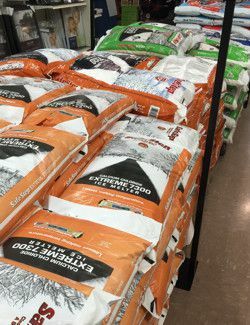 However, when snow and ice develops, it is hard to avoid their use, so this is what we recommend: 1) shovel snow first, 2) use a potassium chloride, calcium chloride, or magnesium chloride blend product and apply sparingly, and 3) consider mixing with sand to provide traction around steps. Decks can be very slippery when wet, so always use caution on wet days! Composite (or TREX) decks hold up much better to chemicals and can resist frequent applications of any ice melter, including rock salt.